In North of Hope, Shannon Huffman Polson shared her journey in grieving for her father and stepmother’s death. One day, she was with her brother and his wife at an open air market and she received the dreaded phone call that nobody ever wants to hear. There has been a terrible tragedy that forever changed her life. Her stepmother and her father lived in Alaska. They were travelling and exploring the wilderness when a bear came upon their campsite and the bear brutally killed them. Shannon Huffman Polson found their notebooks and journals which in details described their actual whereabouts and which route they took. A year later, she gather up her adopted brother, Ned and his work colleague, Sally and they travelled the exact route. She discovered that the bear that killed her father and stepmother was a barren-ground grizzly and they are very aggressive creatures. The book described in full descriptions what Shannon experienced and saw along the way. The book also covered the relationship and memories of her father and stepmother. She revealed her disappointments and her feelings of always trying to please her father. All she wanted was her father to be proud of her and she struggled with living for herself. For example, she shared that she went to Airborne School and when she came home for a visit. Her stepmother removed all of the pictures of the children and had a random friend’s child photo on the kitchen counter. Her dad reassured her that he remembered each of his children being born and he has the memories. I can definably understand how that would make anybody feel unwanted or unloved. I would have most likely reacted the same precise way. That pointed out to me that children see everything that you do and they look to their parents for their value and worth. I would recommend this book to anyone who is undergoing grief and they are looking for encourage from someone who has been there. Shannon Huffman Polson story will inspire you to enjoy every moment with the ones you love deeply. Her journey in Alaska wasn’t an easy ride, at times it was extremely painful. I loved how Shannon Huffman Polson was very real and transparent about the grief she experienced along the journey. She elucidated that she hated getting asked, “Are you over it yet?”and “Have you moved on?” These questions are the type of questions people shouldn’t ask when you lose a loved one. How are you supposed to answer that? Does that bring you any comfort? You don’t ever get over people you care about and love. The memories you shared together still lives inside you. If you’re looking for a book from an author that has suffered tremendous lost and is willingly to help others through the pain, then read this one! 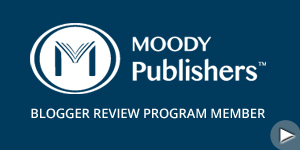 "I received this book for free from Handlebar Marketing/ Zondervan for this review". When the opportunity came up to join the official launch team for The Christian Parenting Handbook. I gladly applied and I was accepted. I have been reading a review copy of the book and it’s has taught me a lot of new concepts of parenting. The book will guide parents into being a better parent. The Christian Parenting Handbook is a new exciting resources for parents to use to connect and make a lasting impression on the hearts of their children. This is an excellent life changing book for any people who would like to have children, expecting parents, and people who are already parents. There are 50 principles presented in this book. Consistency is Overrated, Build Internal Motivation, Consequences Aren’t the Only Answer, Envision a Positive Future, Teamwork….Individual at Their Best, It Takes Two to Argue, but Only One to Stop, Discipline Kid Separately for Siblings Conflict, To Spank or Not to Spank, The Value of Grandparents, and much more. Please check back for a review later this week. Buy The Christian Parenting Handbook between April 29 and May 5 and get a package of free resources valued at more than $400.00. You can learn more on our website about the 8 items contained in the Bonus Parenting Package. In addition, you can get The Christian Parenting Handbook Companion Guide (This is a workbook with audio clips that will help you apply the material in The Christian Parenting Handbook.) for free if you purchase 5 copies or more of the book. Simply make your purchase from Amazon, Barnes and Noble, BAM (Books A Million), CBD or Parable. Dr. Scott Turansky and Joanne Miller will be hosting a Google Hangout on Tuesday evening April 30 starting at 7:30 pm EDT. This will be an on-air hangout where anyone can listen in. You can watch the video by going to the Biblical Parenting Facebook Group. You can also comment there and ask questions of Scott and Joanne. Plan on joining us and start spreading the word. You’ll want to use the cool banner below. There will be lots of good interaction about parenting and about the book. We’ll also be giving away prizes. 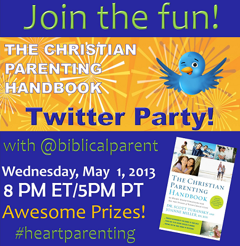 The Twitter Party will be hosted by @biblicalparent. You’ll want to follow this handle so that you get the latest updates. The hashtag is #heartparenting. The authors is generously letting me give away 5 individuals prizes to celebrate and help parents grow into the parents God has intended them to be. Contest open to United States Residents only. Make sure you enter both giveaways for a chance to win amazing prizes. In Bound Together, Chris Brauns explored the concept of how everyone is connected together and we’re bound together. What one of us does, affects everyone else. We’re not lone rangers and we’re created for community. Adam was commanded by God to be fruitful and multiply and to have dominion over all creatures. They could have any fruit they wanted expect from one tree. Satan tempted Eve into eating from the forbidden tree of knowledge of good and evil and she talked Adam into it. Everything changed! Chris Brauns used the principle of the rope to elucidate that Adam’s sin in the Garden of Eden has profoundly impacted all generations. Since then, sin has consumed every generation and we’re all guilty of sinning. Because we’re all a part of Adam’s descendants. He used the term “solidary” to describe the principle of the rope. Solidary, denotes “a union of interests, purposes, or sympathies among members of a group. It speaks to the ties that bind a group together” Page 26). The book also goes on to say that Christ has died for our sins and when we received salvation we become a portion of His body. Christ is the ultimate head of the Church and the body. His death allows us a chance at repentance and forgiveness from our numerous sins. Chris Brauns shared the example that if he leaves his wife and children it will negatively hurt everyone not just himself. We can’t assume that our choices that we make only effect ourselves. Chris Brauns also stated that divorce is like an amputation and it should only be done when it’s the last choice. Divorce brings deep emotional pain to everyone involved. He also discussed the significance of marriage and how God compared marriage to our union with Christ. Marriage bonds and ties us emotional, physically, and spiritually to another forever. Scriptures remind us that wives are supposed to submit to their husbands. And the man is the head of the wife like Christ is the head of the church. This doesn’t mean that if the husband is abusing the wife then you should submit. The scriptures also tell husbands to love their wife like Christ loves us. Basically this means we’re both called to love each other when we made the vow before the Lord to care for another person until the everlasting. I would recommend this splendid book to anyone who has ever wondered why we have to pay for Adam’s and Eve’s sin and to people who feel believe their choices doesn’t harm anyone but themselves. This book goes into vast detail on the how each person’s life affects another whether we realize it or not. I loved the story of Rehab that Chris Brauns clarified. Rehab was a prostitute in Jericho and she hide the spies of Israel in her home. She asked the spies if God could spare her and her family from the destruction of Jericho. God answered her and they were the only family freed from the annihilation of Jericho. The grace of God forgave her for her sinful past and she became a huge follower of Jesus Christ. I cherished how Chris Brauns used this point to remind readers that the grace of God can cover them and He can forgive you for your sins. Even if your family has a history of generational sins, it can be broken completely with Christ’s assistance. I immeasurably loved the chapter devoted entirely to marriage and it helped me to see the importance of marriage in God’s eyes. Even though I haven’t met my wife yet, it gave me a much needed reminder on what my roles of a husband are intended to be. The book was an enormous reminder that our actions and behaviors doesn’t just impact us, they influence the next generations for good or for bad! It’s up to us to make a wise decision on which one we will ultimately choose. If you’re looking for a book that you reveal to the truth about why people suffer and how our choices affects others, then this book is for you! Stress Test is a fiction novel that contains loads of suspense for the reader to enjoy. This is the first book that I have read by Richard L. Mabry. I can truly declare that he knows how to write an intricate plot that will engage readers into the very last page. I would recommend this book to anyone who loves to read medical, mystery, suspense, romance, and adventure filled novels. I deeply connected to Matt’s, who is a likeable doctor and he is exceedingly determined to save the patients’ lives. He has a dilemma and is being framed for a murder that he didn’t commit. I extremely don’t like when the innocent are being set up and injustice is taking place. Sandra is a lawyer that is struggling to find love and she prays to God one day to guide her in finding her husband if he even exists. God heard her prayer and throughout the book you will see if God does indeed have a husband for her. She also represents Matt and she tries to prove that he truly is innocent of the murders. I immensely loved the Faith aspect of the novel, Matt wasn’t trusting God and didn’t really understand God’s love for him. But when circumstances began occurring and he has no one else but God to turn to. He starts praying again for the first time in years to be set free from the murder charge. Sandra on the other hand was a professing believer and has trouble dating doctors because of her last bad relationship with a doctor. Both of these characters have a lot they must overcome and deal with. The novel gave me encouragement that I should continue seeking God in finding my wife and the book displays that God can turn anything around. The book also had massive amount of twists and turns that I didn’t see coming. If you’re looking for a new exciting fiction novel to read, then this one will definably influence that God is in ultimate control and he can turn everything bad to good. The novel left me with a sense that God is directing our paths if we don’t see how everything is going to work out.